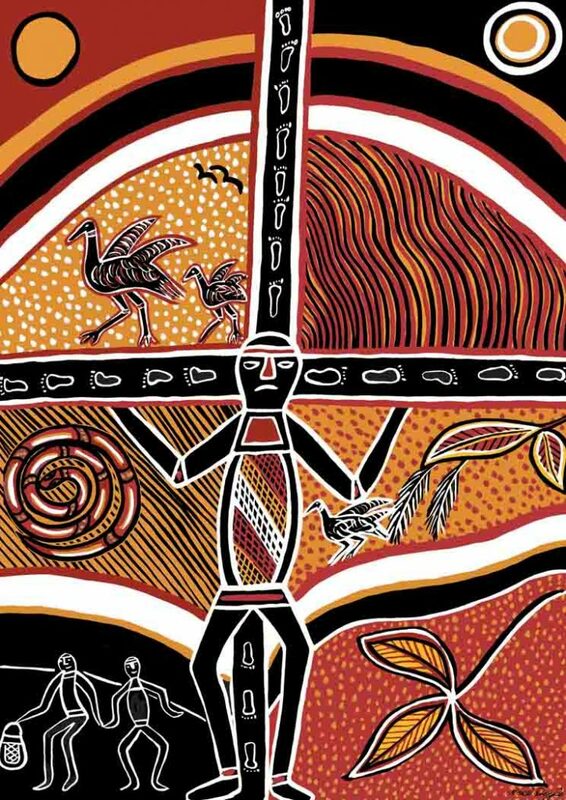 This is the story of the Ancestor Nagorku, a Creation Ancestor who followed the great songline, (journey) of the Barramundi Dreaming. His journey took him along the coast from Cape Don, North Queensland, inland into the rivers and creeks of the region. There he found a ‘Dreaming’ site for the Barramundi at Maragalidpan Creek. 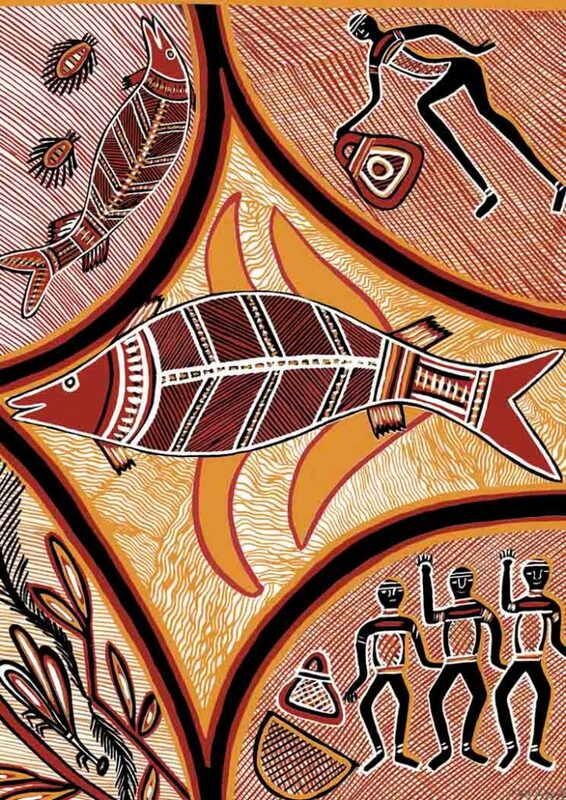 This tale starts with the fishing village, where the dreamtime barramundi, says the legend, was spotted by three hunters, one of whom, Nagongbid, approached and managed to spear him. But before they could return for the great feast, the Ancestor Nagorku steals the dilly bag and Barramundi. He flees southwards, towards the inland creeks and rivers. The brave men of the tribe follow. They must battle through the gullys and cross danger waters. Along the way they must battle against the monsoon and floods. 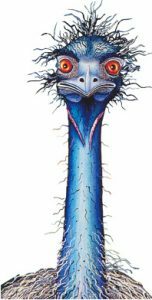 Along the way, they meet the wise praying mantis and helpful dolphin, which aid them in their chase of the Ancestor Nagorku. They crept upon Nagorku as he slept by the Maragalidpan Creek. They stole back the great Barramundi Milaybuma, and he cooked upon banana leaves that night. In the Dreamtime . . . Many centuries ago, two aboriginal women were working in a grassy field, culling the wildflowers and weaving their stems into garlands for self-decoration. On this same field was an Ancestor Spirit of the Dreamtime, practicing the throwing of his magic boomerangs. A boomerang, in its homeward flight, fell to earth at a spot just next to the women. One of the women picked up the magic boomerang and kept it for herself. The Ancestor demanded it back and ordered the woman to bring it to him. But she refused, and made derisive comments about his skill with the boomerang. She told the Ancestor she would keep it. This brought great anger to the Ancestor and he put a curse upon both women, and everyone from their tribe as well. By the Ancestor’s magic they were all swept up into the sky until they shone brightly in the distant as stars. For the woman who had taken the boomerang, the Ancestor turned her into a boomerang in the sky, which we know as the new moon. Through the month she grows fatter until she is a fully round full moon. The other woman had in the eyes of the Ancestor commited a smaller crime, and being a minor culprit was turned into a rainbow who would only come after the rains. Many, many years ago there lived a huge crocodile that lived in the estuary of a big river. People came to the river to fish, but they were never aware of the crocodile, watching them from the opposite bank, hiding amongst the mangroves. 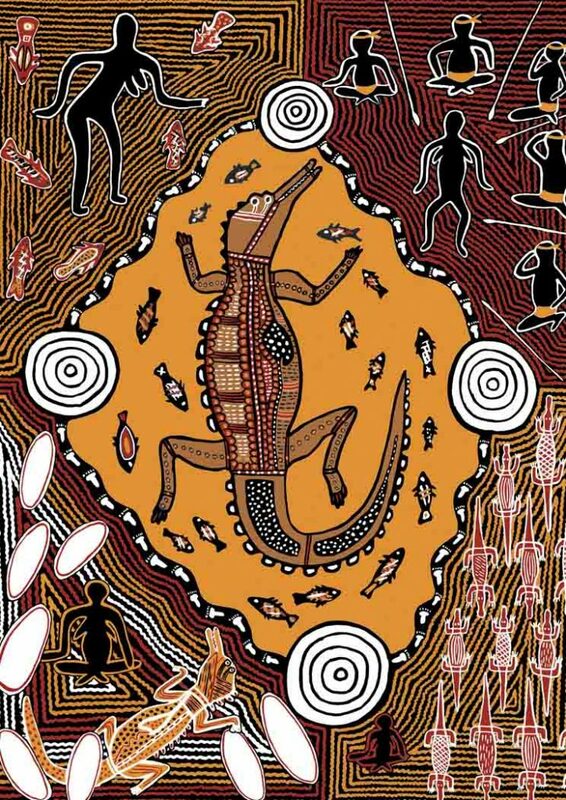 One day, while the tribe was fishing, the crocodile slipped into the water quietly and crossed the river. He suddenly sprang from the water’s edge and knocked a woman into the water, his domain. The crocodile took the woman to his cave and decided he would keep her as his own. The crocodile would catch fish for the woman, and soon wished for her to live with him forever. The woman was scared, and one dark night she awoke from sleep to find a thin stream of light entering from the roof of the cave. Quietly, she started digging upwards towards the light. When she finally reached the light she was full of joy that it was the night sky, and she rushed back to her tribe, never once looking back. The tribe was surprised to see her alive, and all gathered around the fire to hear her tale. Then a noise came from the bushes nearby, and the giant crocodile leapt from his hiding place with a fish in his mouth. He circled the tribe until he came to the woman, looked at her with love-filled eyes, and dropped the fish by her side. At this moment the men of the tribe sprang to their feet, grabbed their spears and killed the giant crocodile. Through-out the monsoon the woman felt great remorse for the crocdile. Once the monsoon passed, she went straight to the crocodile’s nest, for she held a great secret. The woman and the giant crocodile had babies together, and the eggs she laid still survived. Her babies were born and looked as their father did, and she felt her loss ever more greatly. When her children grew up, she told them the story of herself and their father, and the the terrible savagery of the tribe. She told her children that they must live to revenge their father, and kill people who come to the river. This is why today people must fear the revenge of crocodiles. “Bahloo the Moon God”. (1999). In the Dreamtime . . . Baiame had made the hills, valleys, streams and rivers. The bare plains that extended over the horizon paid tribute to Bahloo the Moon God, who serenely sailed across the night sky. In Bahloo’s journey he would bring changes to the weather. He brought winter, summer, autumn and spring to his people. When happy, he would bring good weather for all his tribal people across the land. But if he was angered he would bring bushfires, droughts and monsoons. One day Bahloo became very ill. He summoned two elders to his cave. They followed the footprints to the cave and Bahloo was there. They could not see him, but they could hear his voice. He told the elders of the ‘seasons’ and the signs to look for as seasons change. First there will be summer. It will be hot during this time, which will bring monsoons and floods. This time of the year will be called the ‘wet season’. After this comes autumn, a time where the leaves fall to the ground. Birds lose feathers, the grass stops growing and things that are green will turn brown. Then comes winter, which is the time of cold. During the cold times the gods flee to warmer places and there is less rain coming from their battles in the sky. It is a time to seek shelter for your people, as the animals also seeks escape from the cold. Look for the red sky in this season, for it forewarns of great cold. The end of the cold means the coming of spring, where life returns from its slumber and everything is beautiful again. The birds will sing and dance and give birth to their young. Spring is the season that the flowers blossum in vibrant colour. The ancient styles of the Murri nation remained a link to an older time, before roads and cars and modern conveniences. Before acrylic paint we had ochre’s, earth colours. And they lay at the heart of indigenous art. The Murri people find there spiritual home in tropical Queensland, a land less impacted by the modern urban society. Here indigenous people get to live closer to the Dreaming and follow their songlines without the endless need to be economically productive in order to survive. Whilst this lifestyle creates problems, it also offers a chance for indigenous people to submerse themselves in the heart of the old culture. 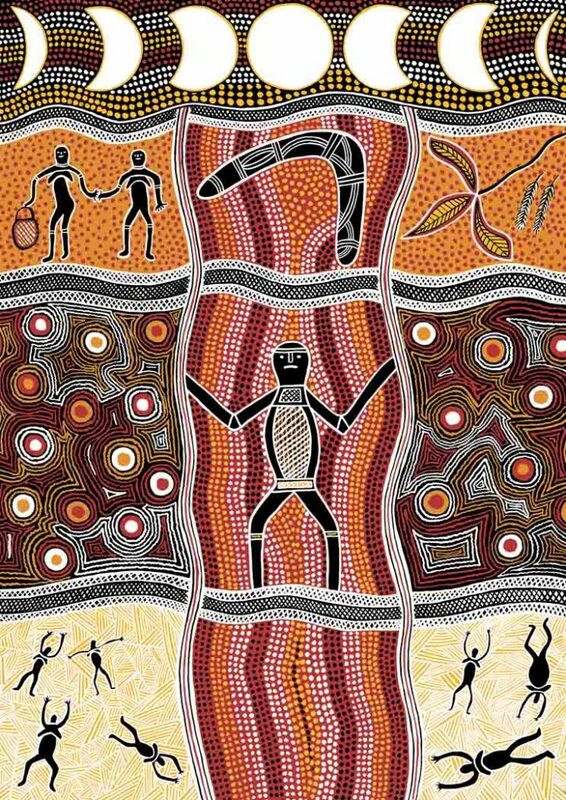 For that Murri art holds a special place in our understanding of a people who do not own the land, rather the land owns them. This is the beating heart of country, and why it draws them so.